Racing for a Cause? Try this Great Pasta Dish: Penne alla Siciliana! A few weeks ago, my mother-in-law Diane came to town for a visit. It wasn’t just any visit however, she came to participate in the 19th Annual Susan G. Komen South Florida Race for the Cure. She is an 11 year breast cancer survivor and last year we started the tradition of walking together in the race. The first time, we didn't really expect her to finish the entire 5K (slightly over 3 miles) but, to our surprise, Diane just kept on going and crossed that finish line with a smile on her face and a spring in her step! We were so impressed and proud and now it is a tradition we look forward to every year. The night before, I decided to make a nice, hearty pasta dish to “carbo-load” in preparation for our arduous walk. I turned to my reliable recipe resource “Savor the Moment” and decided on Penne alla Siciliana (pg. 202). With prosciutto, peas, fresh chives and Parmesan cheese it’s essentially a one pot meal and what’s not to love about those ingredients? It sounded like just the right pre-race dinner! I had to include the recipe below for those of you who may have upcoming races to prepare for. I must confess, we also had a glass (or two) of red wine with our pasta – Diane was on vacation after all! We went with a Spanish red, the 2006 Bodegas Bilbainas Tempranillo Rioja Viña Zaco. With its nice tannins and flavors of black cherry, blackberry and smoky chocolate oak, it paired very nicely with our pasta dish. This wine is made from 100% Tempranillo grapes and aged in both American and French oak in order to achieve the perfect expression of fruit and freshness. Dubbed a "modern interpretation" of Rioja, this tasty and versatile wine was also featured in Wine Spectator’s Top 100 Wines of 2009. It received a 90 point rating and at $15-17 per bottle is great buy! Cook the pasta al dente using the package directions; keep warm. Saute the prosciutto in the olive oil and 1 Tablespoon of the butter in a large skillet for 1 minute. Remove with a slotted spoon. Add the remaining 2 Tablespoons butter, onion, peas, chives, salt and pepper. Saute over medium heat until the onion is tender. Add the beef stock and prosciutto. Cook until heated through. Drain the pasta and combine with the sauce in a bowl; toss gently to mix well. Top with the Parmesan cheese and parsley. Serve immediately. Serves six. After crossing the finish line we headed over to ER Bradley's Saloon to toast the brave lady who, once again, successfully completed the entire walk (and maybe also to remedy a few aches and pains.) Of course I like to think the Penne alla Siciliana played some small part in our completing the 5K with such gusto! It was a beautiful day and we were all so happy to have participated in such a meaningful event with a lady we love so much. Cheers, Diane, we're already looking forward to 2011! Celebrating Friends and a New JLBR President! I recently had a few girlfriends over for a “Savor the Moment” dinner at Chez Miskew (my house). Being almost 60 recipes into my little project I was in need of a little moral support and I also wanted to celebrate my friend Nancy Dockerty's election as President of The Junior League of Boca Raton for the upcoming 2011-2012 League year – go, Nancy! To kick it up a notch, I made a few delicious recipes from “Savor the Moment” as well as one of my own signature dishes, Boeuf Bourguignon with Short Ribs. We started the evening with the delicious and decadent Wild Mushroom Brie (pg. 65). This recipe combines three varieties of mushrooms (white button, portobello and shiitake) together with shallots, chives, sherry, toasted pine nuts and the creamy, cow’s milk deliciousness that is Brie. As if that wasn’t fabulous enough, you then wrap it up in pie pastry and bake it until it is golden brown and the Brie is all melty. If you are a mushroom fan you need to drop what you’re doing and go make this recipe NOW! I also love that the recipe tells you to use the leftover pastry to create a little mushroom to place on top as décor. My husband Steve is responsible for creating the one you see in the photo – I think he did a great job! The dish was very well received by my guests; none of us had tried this tasty “Savor the Moment” gem before. In addition to being a great appetizer, we all agreed this dish would make for a fabulous lunch served with a salad. I paired the Brie with a 2008 Viña Santa Rita Chardonnay Central Valley 120, a white wine from Chile’s Central Valley. It’s made from 100% Chardonnay grapes and aged in stainless steel so no worries about it being an oak monster. It’s flavors of green apple, tropical fruit and buttery pear complemented the Brie nicely. For around $10 a bottle, this also makes for a nice little Everyday Wine too. For the second course, I dished up the Beouf Bourguignon with Short Ribs. I have written about this dish before in a previous blog http://tinyurl.com/yk829ef. It is a combination of some of my favorite recipes for this classic French dish and I think what sets mine apart is using an entire bottle of red wine, Cognac and of course the short ribs! The short ribs necessitate a longer cooking time which just makes everything taste better if you ask me. When I served it for Bookclub a few months ago, we tried three different wine pairings: a Pinot Noir, a Rioja and a Shiraz. The Shiraz was the hands down winner of the contest! I think the short ribs add a richness that necessitates a bigger, bolder wine even though historically this recipe calls for a Burgundy. Tonight I paired the dish with a 2006 Cycles Gladiator Central Coast Syrah. This red from California’s Central Coast was somewhat lighter in style then the Australian Shiraz we originally had, but also complemented the dish very well. It had nice, ripe fruit flavors of blackberry, strawberry and rhubarb with tannins that stood up to the decadent short ribs as well. Also at around $10 a bottle, this easy drinking red would also make a great Everyday Wine choice. For dessert, I decided to be consistent with the decadent fare and go with the Fallen Chocolate Soufflé Cakes (pg. 254). If you know your guests have a predilection for chocolate, you cannot go wrong with this recipe! Delicious chocolate cakes with oozy chocolate centers served with Haagen Dazs Vanilla Ice Cream and a dusting of Confectioner’s sugar – what's not to love? I included the recipe for this divine dessert in my post a few days ago so if you are so inclined, by all means, check it out at: http://tinyurl.com/ygh7egz. Needless to say, the Soufflé Cakes were also very well received and my guests and I were sufficiently stuffed! After a night of laughing, eating, drinking wine and more laughing, the girls headed home and I felt even more committed to the "Savor the Moment" Challenge. The Junior League is such a fabulous group of women doing such wonderful things for our community and, now, one of my great friends is going to be President! I highly recommend getting involved in your local League if not for the great friends or opportunities to benefit your community, then definitely do it for the Cookbook. For more info visit www.ajli.org - Cheers! **Wines for this blog were kindly provided by Republic National Distributing Company. Valentine's Day is this Sunday and I'm sure everyone already has their cards bought, presents wrapped and flowers ordered - right? If not, don't fret! Why not dazzle your siginificant other in the kitchen this year? With your cooking skills, of course! Here are The "Savor the Moment" Top 10 Valentine's Day Recipes (according to me). I chose these recipes from those I have already made and blogged about (except for one, can you guess what it is?) - they are some of my favorites. Whether you're throwing a party or making a romantic dinner for two, these recipes will have your guest(s) lining up to kiss the cook! I hope everyone has a very Happy Valentine's Day spent with the ones they love. Please don't forget to savor every moment - enjoy and cheers! Super Bowl Recap and Praline Bananas Foster Recipe - just in time for Valentine's Day! I just had to share a few photos & details from our "Savor the Moment" Super Bowl spread! We started with the Alligator Eye Dip (pg. 54) – for a vegetarian dish I have to say - YUMMY! The combination of black eyed peas, black beans, green onions, green chilis, black olives, tomatoes and fresh cilantro makes for a winning team. I have to thank Caroline Angstadt, fellow Junior League Member, who suggested a few months ago that I make this particular dip for Super Bowl Sunday. Caroline, you were right on – thanks so much! A few preparations tips: for salad oil I used Bertolli light olive oil; you can really use any “bland” oil you would normally use to make a salad dressing. Also, the recipe calls for 20 chopped green onions – resist the urge to leave some out. It really tastes great with all 20! The only thing I would which add to this recipe that is not included in the ingredient list is salt. The recipe calls for garlic salt but this dish really needed a good dose of regular salt (I used kosher) as well to give it great flavor. I served the dip with some tortilla chips and we dove in! Wine Pairing: 2007 Francis Coppola Pinot Noir Silver Label Diamond Collection. We expected this red to pair better with the Muffuletta; but with it’s yummy flavors of black cherry, currant, spice and earthy, forest floor, it actually went better with the Alligator Eye Dip. Game Day Muffuletta (pg. 139) – Another winner! I would definitely make this mountainous, delicious sandwich again. It’s perfect for watching a game, an outdoor party or picnic and it travels well too. I used a round loaf of White Mountain Bread and after slicing the loaf in half horizontally and hollowing out the bottom a bit, I brushed the bottom layer with garlic that I had sauteed in olive oil with a little dried oregano. I could have stopped right there and used that as a dipping sauce for the bread but I proceeded with the recipe and piled on layers of ham, turkey, salami and provolone cheese. The recipe also calls for marinated vegetables so I used Flora brand “Giardiniera.” According to Wikipedia, Giardiniera is an Italian or Italian-American relish of pickled vegetables in vinegar or oil. Common vegetables in the Italian version, also called sotto aceti, include onions, celery, zucchini, carrots and cauliflower, pickled vegetables in red- or white-wine vinegar. The jar I used contained carrots, peppers, olives, celery and cauliflower in white vinegar and really added a fabulous flavor and “tang” to the sandwich. Wine Pairing: 2008 Cupcake Sauvignon Blanc Marlborough. This 90 point rated, $10 bottle was a pleasant surprise with its bright, juicy flavors of Meyer lemon, lime and nectarine. It really accentuated the tangy flavors in the Muffuletta and was a very nice match. Who knew? This is a great Everyday Wine to keep handy in your fridge and will pair nicely with a wide variety of dishes. Combine the brown sugar and cornstarch in a medium saucepan. Stir in the milk gradually. Cook over medium, heat until the mixture comes to a boil and thickens slightly, stirring constantly. Remove from the heat and add the pecans liqueur, margarine and vanilla. Stir until the margarine melts. Cut each banana into halves crosswise and then lengthwise. Place the bananas in a heavy skillet and add the praline mixture. Carefully flambé the bananas. Spoon ½ cup frozen yogurt into each of 4 dessert dishes. Top each with 2 banana slices and 3 Tablespoons of praline sauce. Serves four. Wine Pairing: Great pairings for this dish would be a St. Supéry Vineyards Moscato or a Trefethen Late Harvest Riesling. Super Bowl Sunday Menu - New Orleans Style! This Sunday, Superbowl XLIV (that's 44) will be played right here at Sun Life Stadium in Miami, FL. I had to double check the current name of the stadium with my husband Steve since it changes about as often as Tiger changes girlfriends (well maybe not THAT often)! Land Shark Stadium, Dolphin Stadium, Pro Player Stadium, Joe Robbie Stadium – how’s a girl to keep up? This year’s contenders for the NFL Championship are the Indianapolis Colts and the New Orleans Saints. After doing a little research, it appears the Saints are the sentimental favorites in this year’s game. Not only as a result of the way the city has rebuilt following the ravages of Hurricane Katrina, but also because they have never, in the history of football, been to a Superbowl! Who knew? Now, I am not the biggest football fan (I, too, have never been to a Superbowl) but I am a sucker for an underdog AND some fabulous New Orleans-style food! Fortunately, "Savor the Moment" is chock-full of recipes to create a fabulous, New Orleans-style Super Bowl menu, . Alligator Eye Dip (pg. 54) – made with black eyed peas, no need to panic! Game Day Muffalettas (pg. 139) – piled high with ham, turkey, salami and provolone cheese what’s not to love? Sausage and Chicken Jambalaya (pg. 169) OR White Chicken Chili (pg. 120) – read my blogs about these two recipes and good luck choosing one. Might as well make both! Praline Bananas Foster (pg. 237) – OMG your guests will never leave! As for what wine to drink on the big day, ideally, you want something versatile that can pair with a variety of dishes and flavors. A sparkling wine would be fabulous (isn’t it always?) whether it’s Prosecco (Italy), Cava (Spain) or Champagne (France), and there are lots of great options at a variety of price points. Sauvignon Blanc or Pinot Gris would also be great choices and would pair nicely with the dip on our menu. For reds, try an American or New Zealand Pinot Noir or an Australian Shiraz or Shiraz-based blend to pair with the Jambalaya and the Muffalettas. If you opt to make the White Chicken Chili though, I think you have to go with beer. Stick with the same beer you use in the recipe, I made it with a Corona and it was delicious! Now, please don’t get the wrong idea. It's not that I'm against the Colts - I actually think Peyton Manning, in addition to being a fabulous football player, is pretty funny too. I had to include one of my all-time favorite Saturday Night Live clips that features Peyton spending some time postively influencing children in a youth program. I hope you enjoy the clip as well as your Super Bowl Sunday. Also, to fans of the winning team, don't forget to savor the moment! Cheers! 9th Annual Chocolate Decadence Event & Fabulous Chocolate Recipes from "Savor the Moment"
Tonight is the Junior League of Boca Raton's 9th Annual Chocolate Decadence Event! "The Sweetest Party in Town" will be held tonight from 6-9pm at The Shops at Boca Center. It is a spectacular evening of sampling sweet and savory gourmet delights from South Florida's renowned restaurants, caterers and more. Great food and wine, music and entertainment make this a truly decadent evening! The fabulous Cookbook committee will also be there selling "Savor the Moment" so please stop by and say hello! Proceeds raised from Chocolate Decadence support the JLBR's programs and community projects. For more information please visit http://www.bocachocolate.com/. Hope to see you there and if all this talk of chocolate leaves you craving more, here are 5 fabulous chocolate recipe suggestions from "Savor the Moment" and the full recipe for one of my absolute favorites, Fallen Chocolate Soufflé Cakes! Cheers and enjoy! Melt the butter and chocolate in a double boiler over hot water. Beat the eggs in a large mixing bowl until pale yellow and foamy. Sift in the brown sugar and baking cocoa. Add the chocolate mixture and stir until thickened. Spoon into 6 buttered and sugared 1-cup ramekins. Bake at 300 degrees for 20-25 minutes or until the edges are dry but the centers are still soft. Let cool for 20-30 minutes; the centers will fall. Unmold from the ramekins or serve in the ramekins. Serve warm with vanilla ice cream and chocolate or raspberry sauce. Note: The cakes can be made up to 12 hours ahead and chilled. Reheat in a 300 degree over for 5-8 minutes or microwave for 1-2 minutes or until warm. Serves six. Experiencing Pasta Withdrawals? Try Basil Cream Penne! After experiencing acute carbohydrate withdrawal following my previous meal of Grilled Chicken Breasts and Parmesan Cheese-Crusted Zucchini, I felt it was probably wise to gradually taper off my pasta kick. After a few days without it, I was in need of a serious fix! While flipping through the Pasta chapter in “Savor the Moment” my eyes landed on one recipe in particular: Basil Cream Penne (pg. 198). Sounds decadent, doesn’t it? I’m here to tell you – it is! The classic Italian flavors of sun-dried tomatoes, toasted pine nuts, fresh basil, and Parmesan cheese come together in a simple, yet supremely satisfying, dish. Preparation is a breeze as well, making this dish downright dangerous! To toast the pine nuts place them in a dry skillet and heat them over medium heat. Be sure to keep a close eye on them – this is not the time to be multitasking because once you begin to smell them, they are done! I also used a good Parmigiano-Reggiano cheese. I adore that wonderful nutty, salty flavor and that unmistakable granular texture. You can tell it’s genuine Parmigiano-Reggiano by the markings on the rind of the cheese. 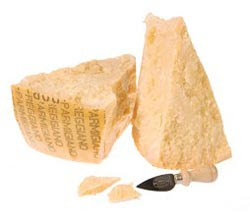 Only those cheeses that pass certain specifications are heat branded on the rind with the official logo of the Consorzio del Formaggio Parmigiano-Reggiano Parmesan. I served the Penne with a 2008 Calera Central Coast Chardonnay. Now don’t get the wrong idea, this is definitely not one of those infamous, oaky California Chardonnays. This particular wine is aged in 10% new French oak for ten months and put through 100% malolactic fermentation. What the heck does that mean, you ask? Essentially, that translates into reduced perception of oak and a nice creamy mouthfeel for the drinker. This medium-bodied wine turned out to be a delightful pairing for the pasta with notes of tropical fruit, lemon cream and honeysuckle. It also has a delicious, lengthy finish with subtle flavors of brioche and toasty oak which really highlighted the flavor of the pine nuts and complemented the creaminess of the pasta. With a $16 a bottle price tag and a 90 point rating from Wine Advocate I suggest you try this wine – even if you think you aren't a Chardonnay fan! I have included the recipe for the delicious Basil Cream Penne below and I really hope you enjoy it. Now, I have to get myself to a gym – cheers! Soak the sun-dried tomatoes in hot water in a bowl for 3 or 4 minutes. Drain, pat dry and mince. Toast the pine nuts in a skillet over medium heat just until lightly colored. Combine the butter, cream, salt and white pepper in a large saucepan. Simmer for 10 minutes. Add the pasta, basil and sun-dried tomatoes and toss to coat well. Stir in the cheese. Cook for 4 to 5 minutes or just until heated through and creamy. Spoon into a serving bowl and top with the pine nuts. Serves six.